'The integrity of the personality' was included in an exhibition on the theme of 'consciousness raising', referencing the feminist movement of the 1970s, and the artist's memories of it. 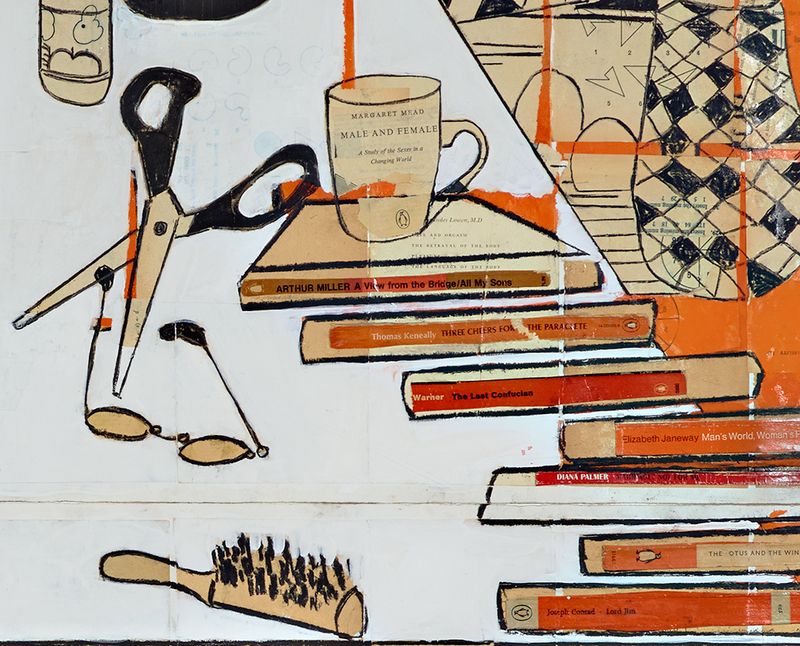 The work is a melange of drawing, paint and collaged pages, covers and book spines of various texts. The work takes its title from a book of the same name by English psychiatrist Anthony Storr (1961), which is included as one of the collaged book spines in this work, along with other key texts of second wave feminism, psychology and education such as H J Eysenck 'Know your own IQ', Margaret Mead 'Male and female', John Holt 'How children learn' and Diana Palmer 'Marriage? Not for me', as well as fiction titles. 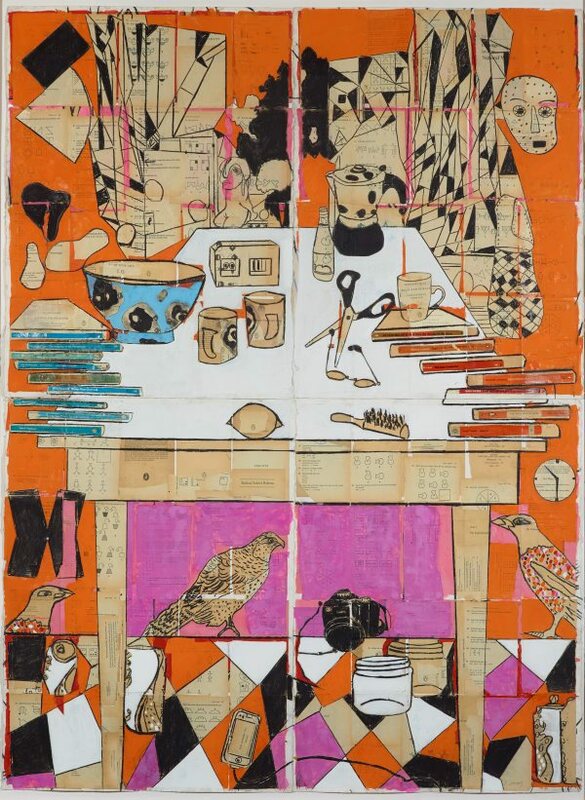 The setting of the work incorporates the interior of the artist's studio, with a view of Federation Square in Melbourne, viewed over a table, a key motif in many of Hattam's works. The orange/blue palette is drawn from the iconic colours of Penguin Books - orange for fiction/imagination versus blue for non-fiction. Items such as hairbrush, table, camera and scissors refer to a personal iconography of domestic/artistic objects. Hattam has an interest in psychoanalysis (shared with her mother) - Anthony Storr was a Jungian. There are layers to the work, with some areas collaged or painted over and earlier layers (such as the large bird) remaining. The compressed picture plane and strong linearity of the black charcoal drawing reflect the artist's interest in Chinese and Japanese prints and her return to drawing as a primary aspect of her practice. Signed l.r. corner, pencil "K HATTAM". Not dated. Helen Campbell, Look , 'Stuck on you', pg. 16-19, Sydney, Sep 2016, 17 (colour illus. ), 18.